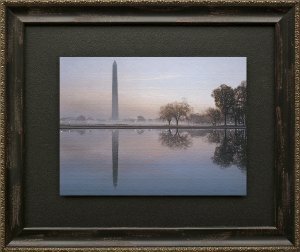 Dawn's Early Light is a striking example of Rod Chase's ability to make a simple monument so very elegant. Chase spent days researching and photographing the Washington Monument. This 555-foot-tall obelisk, built at intervals between 1848 and 1885, memorializes George Washington's loyalty and devotion to principle and country.